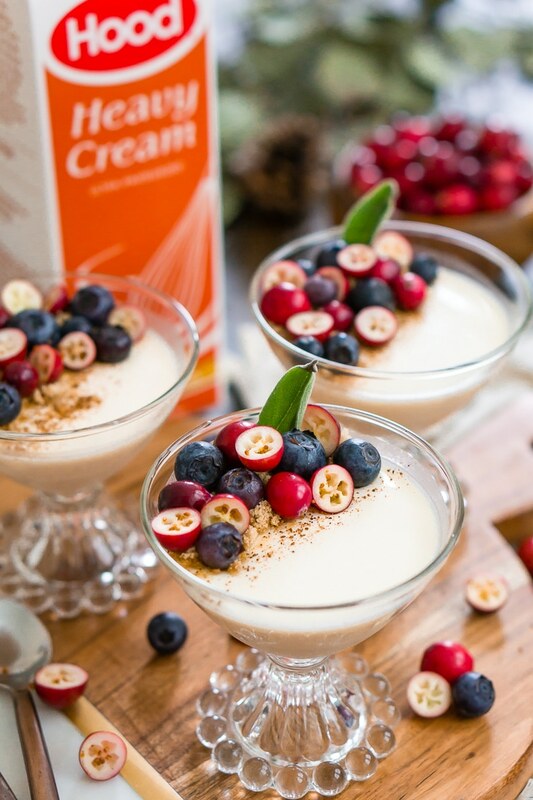 This Maple Panna Cotta is a light and creamy fall dessert that’s simple to make and impressive to serve holiday dinner guests! Autumn in New England is something truly special. The trees are alive with color, the harvests are bountiful, and the holidays are straight out of a storybook. 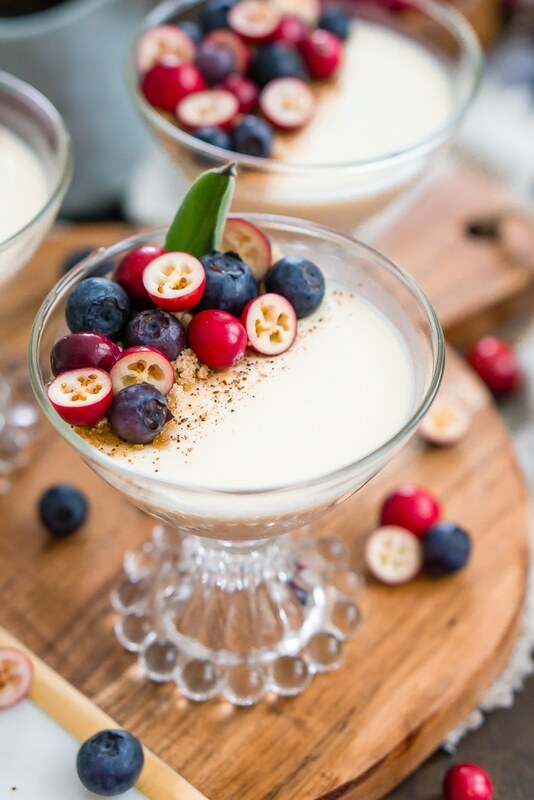 Generally, the dessert table is covered with things like Grammie’s Apple Pie and Pumpkin Crumble Cake, but I think it’s important to lighten things up every now and then with dishes like this Maple Panna Cotta. 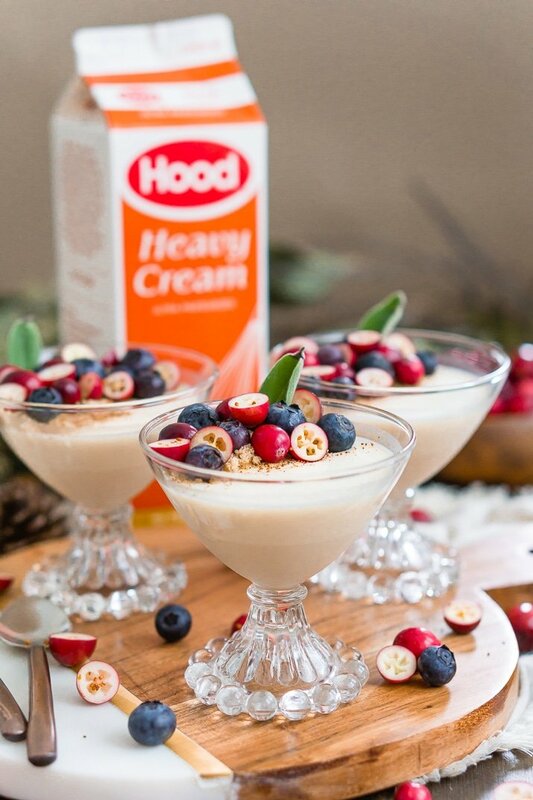 It might seem weird to serve up an Italian dessert for Thanksgiving, but I promise you when you use seasonal New England ingredients like maple syrup, blueberries, cranberries, and Hood® Cream’s thick and delicious Heavy Cream, this dish is an impressive holiday hit just waiting to happen! I’m so excited to be partnering with Hood again this holiday season to bring you delicious recipes your family with love! I love using Hood Cream because it’s a product I can rely on, it shows up to the party and delivers a knockout performance every time. It’s also the key ingredient in my Peanut Butter Frosting and Vanilla Icing and what makes them truly magical recipes! 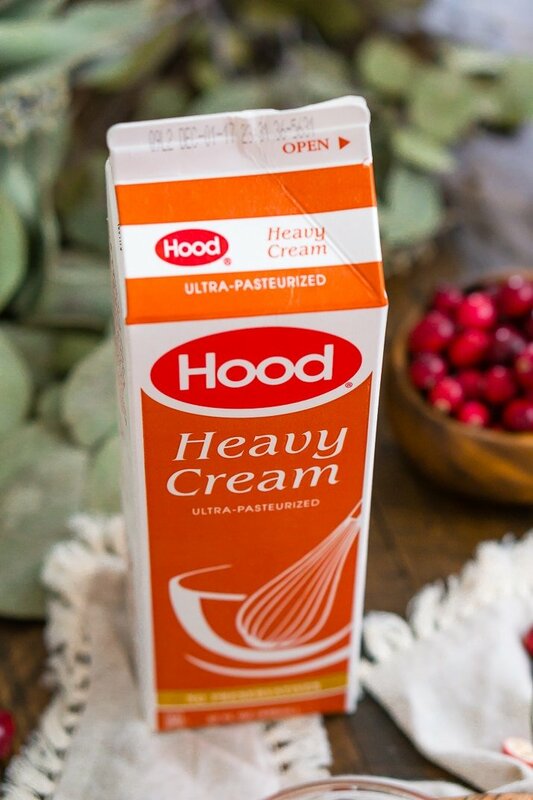 Hood dairy products have been a household staple for generations, especially around the holidays when eggnog and whipped cream are in high demand! Funny enough though, the idea for this recipe didn’t come to me while I was in Italy this year or ever here at home in Maine! I was actually in Australia of all places when I saw it on the restaurant menus as part of a brunch dish. I immediately knew it was something I needed to try and make back home. 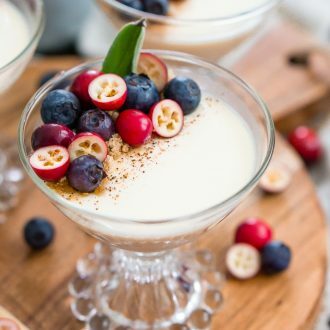 Earlier this year, you guys loved my Buttermilk Panna Cotta, and it’s still one of my favorite dinner party desserts. Panna Cotta is so elegant, but it’s actually really easy to make and doesn’t require a ton of technique. All you need is a handful of basic ingredients, a few minutes of waiting and warming and several hours of chilling and you’re left with this silky, creamy, and rich dessert you can brag about! Panna Cotta is a basic soft-set pudding made of dairy that has been thickened using gelatin. Where Did Panna Cotta Originate? What Does Panna Cotta Mean? It means cooked cream. When it first originated, the cream was simmered with fish bones to help it thicken. Thank goodness we have gelatin for that now, amirite? Is Panna Cotta Gluten Free? Why yes, it is, so glad you asked! How Long Does Panna Cotta Last? Once made, Panna Cotta can be left in the refrigerator for two days without toppings, before being served. This makes it a really great make-ahead dessert for the holidays! 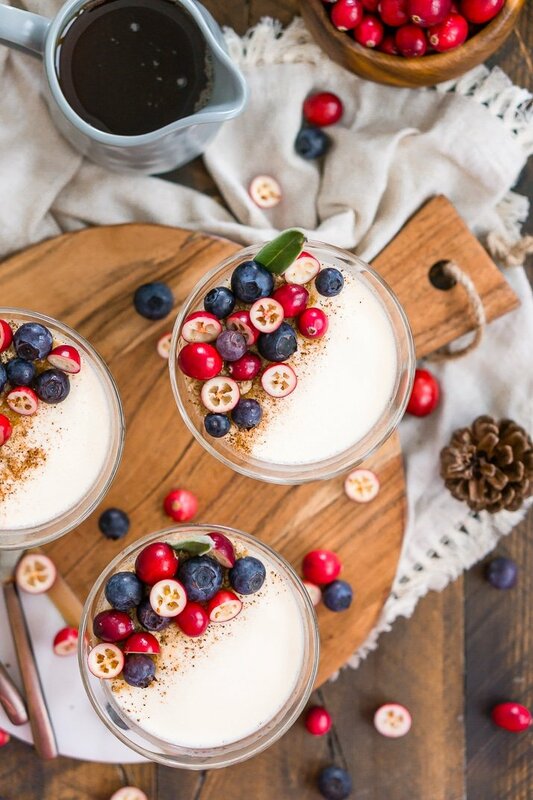 This Maple Panna Cotta is a light and creamy fall dessert that's simple to make and impressive to serve holiday dinner guests! Add 1/2 cup of whole milk to a large bowl and sprinkle the gelatin over the top and let sit for 5 minutes. Do not stir, let the gelatin bloom. Pour the remainder of the whole milk into a medium saucepan and add in the heavy cream, maple syrup, and vanilla extract. Heat over medium-high heat until very hot, but not simmering. Pour the maple syrup mixture into the gelatin and milk bowl and whisk until gelatin is dissolved. Pour mixture evenly into 6 to 8 glasses or ramekins. Cover with plastic wrap so a skin doesn't form on the top of the Panna Cotta and refrigerate for at least 6 hours to set. 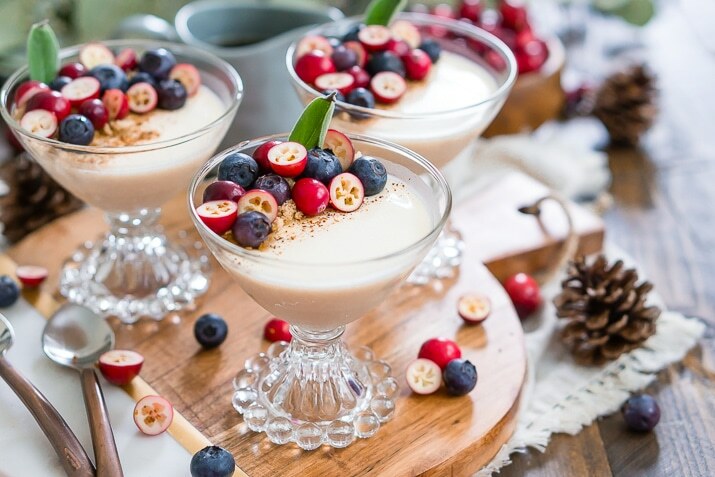 Just before serving, sprinkle the top of each Panna Cotta with brown sugar and nutmeg and top with blueberries and cranberries. Find more great recipes on the Hood Cream website and don’t forget to follow them on Facebook, Instagram, Twitter, and Pinterest. Pin This Panna Cotta Recipe for Later! What a fabulous idea for the holiday season. So pretty, make ahead and I’m sure super tasty! I made these for a pre-fall dinner for 24. Used honey crisp apple matchsticks, real maple sugar sprinkle, and maple toasted pecans as garnish. They really complemented the Panna Cotta! I did leave out the maple flavoring as I am a bit of a purist and like to let the syrup shine. The results were delicate and creamy. Light but decadent. Thanks for the recipe!